To Austin and Back for Zola Jesus at The Parish, in the Rain. 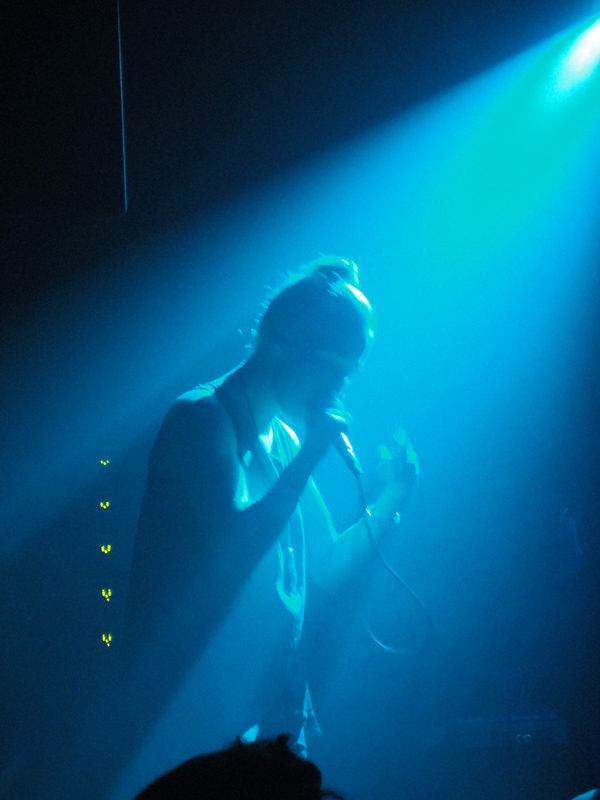 Last night we drove down to Austin to see Zola Jesus play at The Parish. Tickets were a whole ten dollars, and since picking up Conatus in Barcelona, we’ve become increasingly bigger fans of her. The openers were “not my bag” so to speak. We skipped most of Technicolor Hearts’ set, so I won’t really speak on them. We watched Talk Normal, but they weren’t really to my taste. The vocals seemed to be turned up a little too loud, and for a band called Talk Normal, they had an ironic penchant for making incessant weird noises with their voices. They have two vocalists, and to their credit, they both have strong voices. At times it sounded as if the vocal style was influenced by Buffy Sainte-Marie. But in general, I thought they fought each other for dominance too much, and they could have benefited from backing off the eccentricity a bit from time to time – not to conform, but to give the sound more varied texture. Zola Jesus’ set itself was great. I wasn’t entirely sure what to expect from her live, and I’d avoided seeing any live footage in order to preserve the thrill of discovery. I somewhat expected her to step out on stage alone, and stand solemnly and sing against a track, showcasing only the voice. My expectations were incorrect. She was accompanied by a band consisting of a violinist, a drummer, and a keyboard/synth player. When she stepped out for the first song, I thought for a moment that my expectation of her stage presence was going to be correct. But then as the beat began, her somber posture jerked into a dance. She spent the entire show jumping, dancing and running or pacing up and down the stage. I was surprised by how high energy the show was, but once it started, it made sense, and I felt foolish for expecting it to be otherwise. The sound was very true to the sound on-record. Part of me had wondered if her voice was artificially filled out a bit on the record; it is not. The power of her voice comes from breath support not artifice. There was a brief moment of trouble with the mic cutting out. She acknowledged it only with a brief look as it happened, and then after the song she switched to a different mic and carried on unaffected. She also ventured out in the crowd at one point, jumping wildly in the midst of circles of the audience imitating her. After she climbed back on stage, I realized that she’d still used the corded mic during her excursion. I guess the audience must have been more careful to avoid stepping on her tail than they were to avoid bumping into each other throughout the night. Despite the dancing and moving, there was something somewhat.. somber about her stage presence that is hard to describe. She seemed very intently focused. When she finished bending over the crowd, she’d snap back into straight, commanding posture. Her arm movements sometimes vaguely reminded me of The Fifh Element’s Diva Plavalaguna. The show finished with a version of Vessel that ended with her banging on a high hat before walking off stage. Just as I expressed doubt that there would be an encore in this venue, she reappeared to play Poor Animal, with her tight top now shaken loose just a bit. We went a little crazy at the merch booth – picking up two t shirts, vinyls of The Spoils, Stridulum, and Valusia, and a poster. The merch girl was one of the friendliest merch people I’ve ever encountered, letting us poke at t shirts and compare sizes cheerfully. After the show, we realized that it was pouring down rain, more so than it had been when we came in. I rolled up the poster and covered it in a t shirt before tucking it under my jacket, and zipped all the cameras into my fortunately vinyl purse. 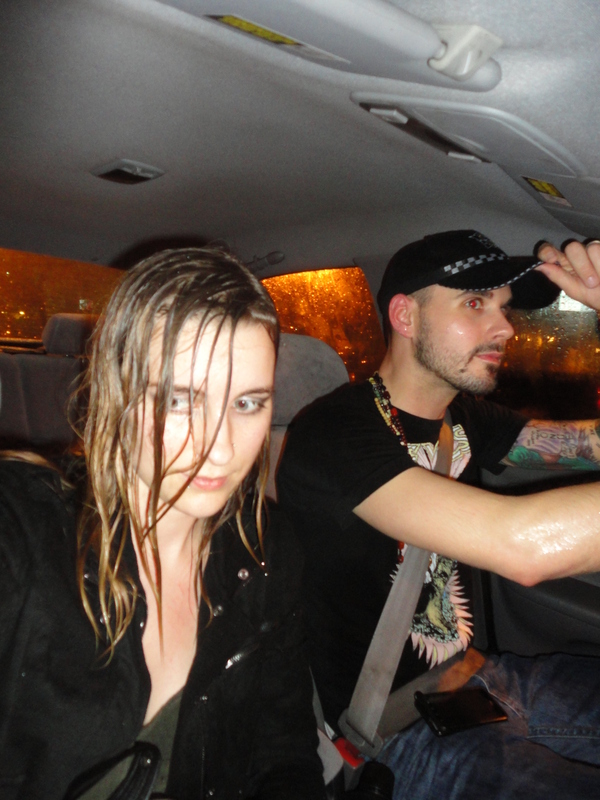 We ran back to our car on a Sixth Street that had devolved to a soaked mess. Girls in T&A dresses picked their way along like shakey wet rats on slippery heels. Umbrellas in the hands of the intoxicated jutted into our path here and there, creating miniature hazards. All around were cop lights and sirens referencing some unseen calamity, and my soaked canvas shoes just kept slapping the street beneath an inch of water and I couldn’t stop laughing as I ran. I wanted to take pictures or video, but didn’t dare to take the electronics out of their protector. We reached the car, and raced back to Dallas with a heavy foot and the focus of energy drinks.